After observing homelessness this week, I have revisited some of my older works and have been inspired to create new compositions. The homeless have always been of special interest to me. I first began to see homelessness on the rise back in the mid 1980s when the crack cocaine epidemic began. Drugs, crimes, and the AIDS virus were common elements of life. One of my high school friends found herself caught up in that savage drug called “CRACK” and her life was a rollercoaster of homelessness, violence, and prison. A we began to talk in an effort to help one another, she revealed something most startling. “I have more peace of mind when I am sleeping under the highway bridges.” Wow, I thought. Really? I asked myself if I had ever tried to get comfortable on concrete. After over 20 years of battling homelessness and drug addiction, Glory be to God, she is rooted and grounded in a positive drug-free lifestyle now. Furthermore, this has led to my research of homeless individuals. I am a painter, drawer, and lover of all things related to art. One of my processes is to create homeless narratives. I enjoy the physicality of oil on canvas. 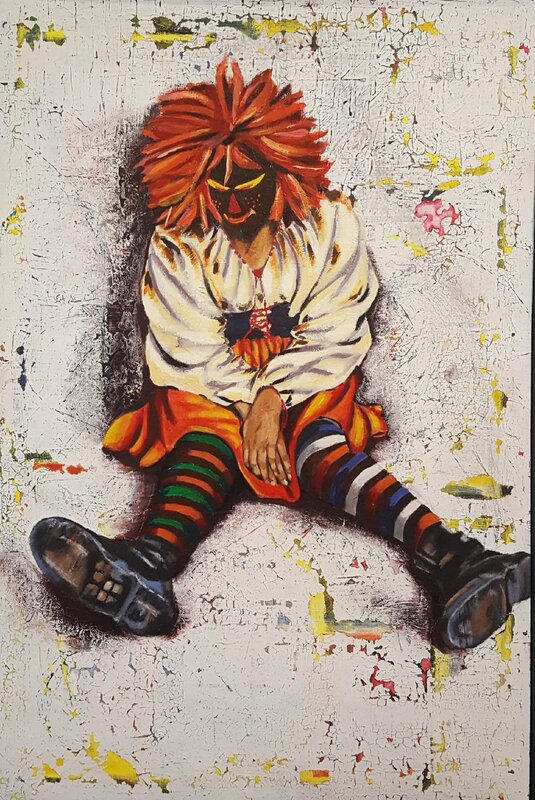 Raggedy Anne Homeless is a narrative-based painting I created from the discussions I’ve had with homeless individuals throughout my years of research.